Pier Giuseppe Gajoni was born in Verona and his parents were both musicians. He has obtained a percussion instruments diploma and specialized under the direction of many very prominent personalities of the orchestral and didactic world, such as Vic Firth, Anthony J. Cirone, Cloyd Duff, Alain Bouqua, Kurt Weller. 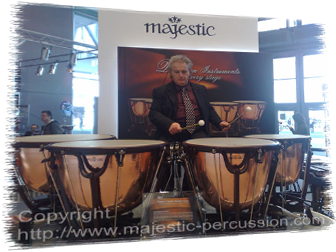 After his first professional experiences he realized that timpani were the instruments that most suited him so he decided to specialize in timpani technique and classic and symphonic literature, attending master classes in the USA, France and Germany. In Germany he stopped for some time working as the Principal timpanist for the R.T.V. Orchestra of M.Gladbach and later for several productions with the European Philharmonic Orchestra, where he was very appreciated as a soloist and worked with some of the most prestigious conductors. Pier-Giuseppe visceral passion for his instruments led him to take part to several courses on sound technology applied to acoustic instruments together with master classes and clinics about restoration, reparation and maintenance for antique and modern timpani. He also completed his studies learning several techniques for the treatment and mounting of natural, semi synthetic and synthetic heads. He has widened any kind of head with the greatest care and is familiar with the many details of mounting methods. He has learned “secrets” from many illustrious colleagues and has himself created new techniques that reveal remarkable impact. In 1996 he opened - unique on Italian territory - a work shop for restoration, reparation, projecting of all percussion instruments. Specializing particularly on the recovering of timpani of any age and origin. 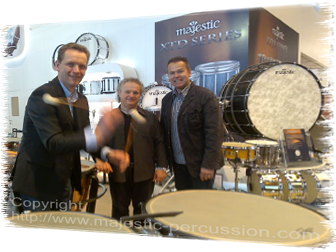 Majestic Holland is proud to have mr Pier-Giuseppe and Anna Gajoni of Koala Percussion as official maintenance, technical support and after sales in Italy for Majestic instruments and especially for timpani. This started a collaboration with the most prestigious and representative artistic and cultural realities that still today keeps him engaged in high quality professional service. Pier-Giuseppe also creates valuable mallets for timpani, known and appreciated by his colleagues in Europe and USA. And he gives courses for teachers on methods for solving problems directly relating to timpanist musical and technical activity. As a drummer he has worked as a session man for many popular artists such as Gino Vannelli, Eugenio Finardi, Marco Masini, Maurizio Solieri, Edoardo Bennato, Aida Lee Cooper and in the studios he has earned the name of… “Doctor Beat”!